Nearly one year ago, DogTime.com first introduced you to U.S. veteran Rusty Reed and his beloved traveling companion Timber, an Alaskan Malamute–German Shepherd mix. For more than three decades, Reed had traveled the countryside alone, living out of a backpack and never staying in one place for long. As his age started to catch up with him, Reed took up camp in an old Ford truck, converting the bed with a camper shell so he’d have someplace to rest his weary legs. One day, while traveling in Washington State, he came across an old pal who’d owed him some money. Rather than accepting the cash, Reed ended up with something much better — Timber, a puppy that would become the veteran’s best friend in the world. Three happy years passed, Reed and Timber driving and making camp all across the Western United States together. But one day threatened to change everything. As wildfires raged near Reed and Timber’s makeshift camp in southern Utah, Timber broke free from his leash, disappearing into the wilderness. Though he searched and searched, Reed feared Timber was gone forever. Alone for the first time in years and desperate to find the dog he’d come to know as his family, Reed knew there was only one person he could truly turn to for help — Sue Rogers, a fellow traveler he’d met only once during a trip to Flagstaff, Ariz.
Rogers, a travel blogger with a legion of readers, took to the web immediately, hoping to use her blog to spread the word about Reed and his missing dog. As luck would have it, Rogers’ network of readers led right to the kind stranger who’d been caring for Timber after her father found the Shepherd mix while on a Utah camping trip. Reed and Timber were reunited in Boulder, Colo., and the pair has been inseparable ever since, hunkering down in the back of Reed’s old converted truck, happy just to be back together. A year later, Reed and Timber have more to celebrate — and more square footage. 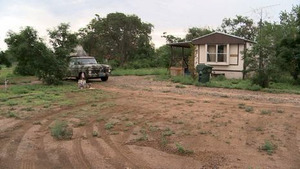 Thanks to a program offered by the U.S. Department of Veterans Affairs and the U.S. Department of Housing and Urban Development aimed at helping chronically homeless veterans, Reed is now able to use a small portion of his military pension to rent a 700 square foot, 2 bedroom-1 bathroom singlewide mobile home in peaceful Chino Valley, Ariz.
Sue Rogers, who has kept in frequent touch with Reed and Timber, tells USA Today she couldn’t be more excited for her friend. Reed and Timber’s story continues to touch the lives of Rogers’ thousand-plus readers, many of whom have become friends with the once homeless veteran and his dog. Some have sent housewarming gifts, everything from household essentials to dog treats for Timber. Two of those readers, Vicki and Larry Reighard, made a trip out to Chino Valley to bring Reed a dining table and four chairs. As for Reed, the overjoyed veteran couldn’t wait to give his best friend Timber what every dog deserves — a yard of his very own. Reed is currently busy constructing a fence so that Timber can safely run free of his leash. But whether living in his cozy new digs or beneath the camper shell in the back of his old 1975 Ford F100, Reed says home for him doesn’t have anything to do with the four walls that surround him—but has everything to do with the four paws and wagging tail always at his side.